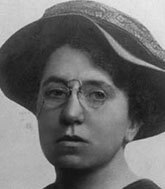 Emma Goldman (1869-1940) stands as a major figure in the history of American radicalism and feminism. A well-known and influential anarchist of her day, Goldman was an early advocate of free speech, birth control, women’s equality and independence, and workers’ rights. Her public stance against military conscription led to an eighteen-month imprisonment before the First World War, followed by her deportation from the U.S. in 1919. For the rest of her life she continued to participate in the social and political movements of her time, from the Russian Revolution to the Spanish Civil War. Recently, the Persimmon Tree editors approached Candace Falk, editor and director of the Emma Goldman Papers Project at U.C. Berkeley (http://sunsite3.berkeley.edu/Goldman), and asked her whether there was material in the voluminous archives that revealed Emma Goldman’s thoughts and feelings about aging. Candace Falk turned the project over to three long-time volunteers, June Brumer, Rae Lisker, and Beth Wilson. These women—in their 70s and 80s, and lifetime activists for peace and justice—spent many hours searching for resonant excerpts from Goldman’s correspondence and writings. “For myself I wish to say that I have been so furiously busy living my life that I had not a moment left to look at it. I am aware that a period comes to everybody when we are obliged, perforce, to sit back and look at life. That period is a wise old age, but never having grown wise, I do not expect to reach that point. Most people who look at life never live it. What they see is not life but a mere shadow of it. Naturally, life presents itself in different forms to different ages… When I was 15, I suffered from unrequited love, and I wanted to commit suicide in a romantic way by drinking a lot of vinegar. I thought that would make me look ethereal and interesting, very pale and poetic when in my grave, but at 16, I decided on a more exalted death. I wanted to dance myself to death. Literary Luncheon for Emma Goldman and Paul Robeson, London. Emma Goldman was an anarchist known for her political activism, writing and speeches. She played a pivotal role in the development of anarchist political philosophy in North America and Europe in the first half of the twentieth century. View More: Next piece "Poems from the North Central States", Home, Archive.